Southern Rockies Nature Blog: Why Didn't the Hummingbirds Die in the Snow? "I'm not dead yet!" (Cornell University). It snowed here two nights ago. It snowed a lot. We had at least eighteen inches — fifty centimeters for those you who like cute little centimeters — or as I prefer to say, "a cubit and little more." Yesterday the temperatures got barely above the freezing point, but today was warmer, and with the southern Colorado sun beating down, the snow is fast retreating. But yesterday, when it was still cloudy and cold, a resident posted to one of the county's Facebook pages (usually devoted to photos of sunset-over-the-mountains-from-the-deck-of-our-new-home), a photo of a hummingbird at a sugar-water feeder with a question: Why was the hummingbird just sitting there and not moving? Was something wrong with it? 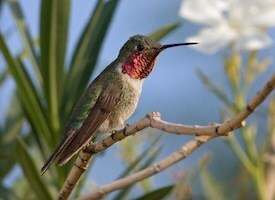 I think that she had a great opportunity to observe the topor of the broad-tailed hummingbird. The Cornell ornithology lab's site says of them, "To survive the cold nights in their high-elevation habitats, Broad-tailed Hummingbirds can enter torpor, slowing their heart rate, and dropping their body temperature." Besides being among the smallest of all warm-blooded animals, hummingbirds also lack the insulating downy feathers that are typical for many other bird species. Due to their combined characteristics of small body size and lack of insulation, hummingbirds rapidly lose body heat to their surroundings. Even sleeping hummingbirds have huge metabolic demands that must be met simply to survive the night when they cannot forage. To meet this energetic challenge, hummingbirds save enough energy to survive cold nights by lowering their internal thermostat at night, becoming hypothermic. This reduced physiological state is an evolutionary adaptation that is referred to as torpor. Torpor is a type of deep sleep where an animal lowers its metabolic rate by as much as 95%. By doing so, a torpid hummingbird consumes up to 50 times less energy when torpid than when awake. This lowered metabolic rate also causes a cooled body temperature. A hummingbird’s night time body temperature is maintained at a hypothermic threshold that is barely sufficient to maintain life. This threshold is known as their set point and it is far below the normal daytime body temperature of 104°F or 40°C recorded for other similarly-sized birds. When hummingbirds sleep and are in the Torpor state, they have been known to hang upside-down. If you find a hummingbird that is hanging upside-down and they appear to be dead, it is actually more likely that they are just asleep. They will probably not even respond if you touched them. If at all possible, leave them alone and they will wake up when they get warmer. The male broad-tails usually arrive during the first two weeks of April — this year it was April 7th. I always expect one snowstorm after this arrival, and this year (so far) there have been three. Obviously, the reproductive advantage of showing up early to claim a good territory must outweigh the chance of becoming a hummingbird-sicle. And torpor is how they do it. Today the resident male (they are all named Chico) was back at the sugar-water feeder. Thanks for this info Chas. I watched a lone hummer sitting on the arm of a deck chair on our porch during the height of this past snow storm. I wondered what was going on with it and now realize it must have been in the torpor state. I've discovered your blog site. Nice!